At Creations Cabinets, our staff is dedicated to providing a low-pressure design and selection process with your goals in mind. Whether your want to resell a property, increase rent for a rental home or apartment, or simply create a kitchen you and your family love, we’re here to help guide you through the entire process. Our primary focus is on great kitchen design, providing a wide range of affordable stock and semi-custom cabinets. We also can provide countertops including granite, quartz and laminate. With over twenty combined years of experience and hundreds of projects completed, our team is one of the eastern metro’s premier kitchen design and remodeling firm. Visit our showroom conveniently located right of 94 in Woodbury, or call us today at 651-683-2625 to schedule a consultation. Easy to price, easy to buy. Check out our 10 x 10 kitchen pricing models for cabinets and countertops and set your remodeling budget in just a few minutes! Need a quick turn around? No problem. 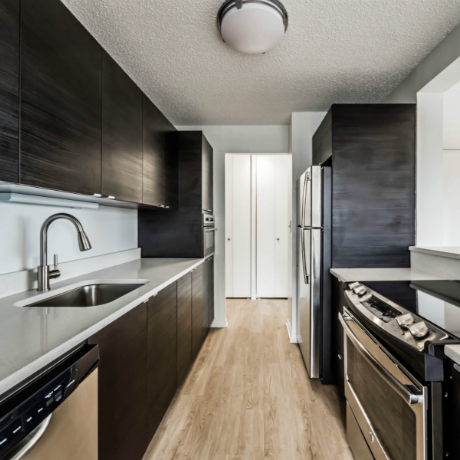 We take the pain out of renovations by providing on-site measures and complete installations of stocked cabinetry, granite, carpet, and vinyl in 2 weeks.